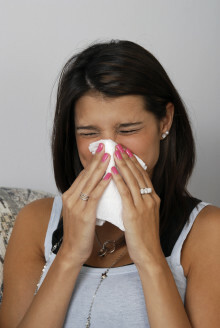 The newly-launched Blueair Friend app tells you what is contaminating the air in your household – and lets you remotely adjust your indoor air purifier. So, perhaps unsurprisingly, the free app for iOS and Android mobile devices has now been labeled one of the top nine ‘gee-whiz’ tech stars of Berlin’s recent IFA consumer tech show by top American online innovation magazine Gear Patrol. Svenska Blueair, världsledande inom luftrening, har vunnit två priser på konsumentelektronikmässan IFA 2015. 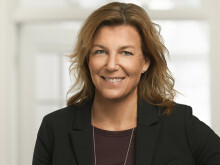 Den nyligen lanserade wifi-anslutna luftrenaren Blueair Sense+ och luftkvalitetsmätaren Aware belönades inom kategorierna innovation och design. 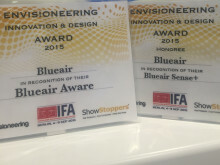 Blueair, a world leader in helping people breathe healthier, cleaner indoor air at home and work, today celebrates winning two Envisioneering Innovation and Design Awards for its breakthrough environmental air purification products. 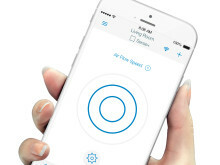 Blueair, a global leader in mobile indoor air purifying technologies, today launched the world's first fully-working 'air sniffing' sensor technologies that connect wirelessly with WiFi-enabled air purifiers and an air monitoring app to battle air pollution at home and work. Blueair, världsledande på mobil inomhusluftrening, släppte i dag världens första lufkvalitetssensor som ansluter trådlöst till wifi-kompatibla luftrenare, och en applikation för att övervaka föroreningar i luften både hemma och på arbetsplatsen. 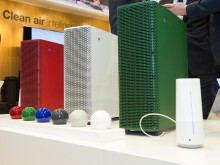 Blueair today unveiled its revamped Classic product lineup at the IFA Berlin 2015 tech show, complete with a new built-in intelligent air monitoring system called ‘Aware’, more convenient user interfaces and an improved clean air delivery rate. Blueair hat den individuellen Umweltschutz mit neuen vernetzten Luftreinigungsprodukten und -technologien neu erfunden, die zu Hause und am Arbeitsplatz schädliche Staubpartikel, Chemikalien und Keime entfernen und so für bessere Gesundheit und Wohlbefinden sorgen. The Blueair booth at Europe's top IFA Berlin 2015 consumer tech show is a mecca of cleaner, healthier air as the company showcases its biggest-ever portfolio of air purifiers and related technologies. Svenska Blueair, världsledande på kvalitetsprodukter inom luftrening, lanserar flera innovationer på IFA i Berlin den 4-8 september 2015. 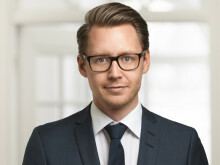 IFA är Europas största mötesplats för nya trender och produkter inom konsumentelektronik. Blueair is to reveal an exciting lineup of new indoor air purification technologies, products and designs from September 4 to 9 at the IFA 2015 Berlin tech show, Europe’s top incubator for emerging consumer electronics. Air purification and white goods industry veterans fill key sales and product marketing with dedicated regional sales offices being established in Europe and Asia. Veteraner från luftrenings- och vitvaruindustrierna tar plats i Blueairs regionala försäljningskontor i Europa och Asien. Studies mapped by Blueair reveal how air pollution is far worse than previously thought, reaching sky high levels in cities across Europe, Asia and North America and leaving a trail of death and mounting lung cancer, heart attack, stroke and asthma levels. Blueair CEO and founder Bengt Rittri says public opinion needs to be awakened to understand the scale of the problem. 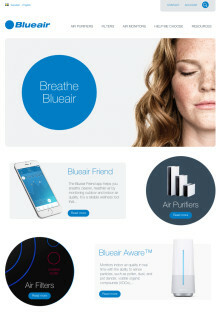 Blueair, the global thought-leader in indoor air purification technologies for enhanced health and wellbeing, today launched a new, redesigned version of its website, www.blueair.com., providing a more user-friendly experience enabling visitors to access detailed product information and videos. Blueair, innovationsledare på luftrening inomhus, stärker sin globala marknadsföringsförmåga för att ytterligare befästa sin närvaro internationellt, höja produktstandarden och utöka märkets inflytande på marknaden. 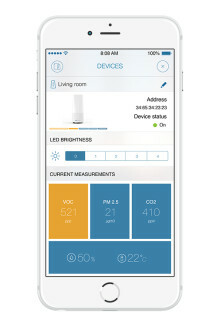 Indoor air cleaning specialist Blueair brings its early warning air pollution App to Android making it available to tens of millions of Indians who use smartphones and other mobile devices powered by Google’s operating system. 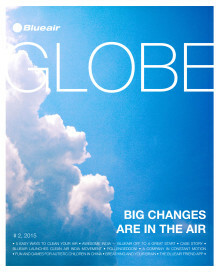 The new edition of the quarterly Blueair Globe magazine is now available in print and online bringing readers Blueair news and updates on indoor and outdoor air pollution issues touching health and wellness from around the world. The latest issue includes how one Chicago company has boosted workplace productivity by harnessing Blueair air purifiers to enable staff to breathe cleaner air. Blueair, verdens førende udvikler af luftrenseteknologi og –systemer til indendørsbrug, har i dag lanceret deres prisvindende 270E-, 450E-, 650E- og Sense-luftrensere i samarbejde med Expert, landets største elektronikforhandlere med over 130 butikker. Blueair brings clean air intelligence to Dwell on Design LA, Los Angeles, CA, with the Blueair Sense+ indoor air purifier, Blueair Aware™ sensor and unique Blueair App that work together to create optimal indoor air fit for humans to breathe at home and work.